The difference in prices of petrol and diesel in India and Bhutan has opened up a new earning option for over 50 families in Jaigaon, the town located on the Bhutan border and Phuentsholing on the other side. 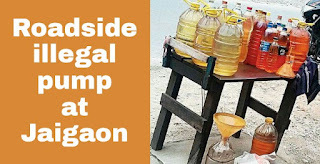 The families are completely dependant on the illegal sale of petrol and diesel, which they buy from Bhutan at lesser prices and sell at higher prices in and around Jaigaon. The trade has flourished further as there is not a single petrol pump in the town or in its surrounding areas. The nearest petrol pump is in Hasimara that is around 15km from here. g ranging from Rs 200 to Rs 1,000 per day, depending on the location of their "outlets". 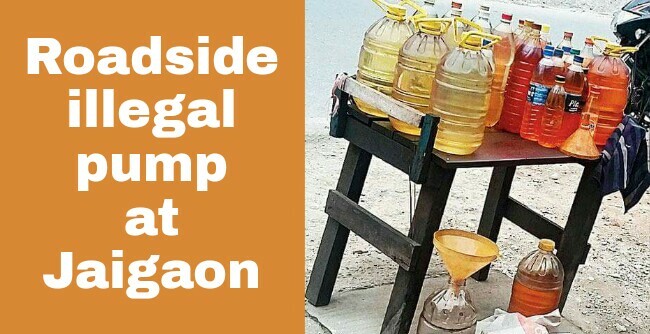 While heading towards Jaigaon, such stalls - in some cases it is just a table or a wooden shelf on the roadside with bottles, filled with fuel, stacked on it - can be frequently seen. Right from Dalsinghpara and Torsha tea estates, the stalls start becoming visible. As one reaches close to the border, "selling points" can be found in areas like Mangalbari and the local bus stand. "Around 600 autos ply in and around Jaigaon and each need around 7 litres of diesel every day. But there is no petrol pump in Jaigaon and these autos are not allowed to enter Bhutan. So, the only option that we have is to buy fuel from these people. There is no point in travelling to Hasimara to refill the tank. It costs more," an auto driver said. Around 40 maxi-cabs that run in the border town also buy diesel from these shops. Added to these, there are two-wheelers. "Two-wheelers are allowed inside Bhutan but the traffic rules there are very stringent. Papers are regularly checked, there is no option for a sudden U-turn and thus, most prefer to buy petrol from these shanties, instead of getting into Bhutan," Ramesh Sharma, a local resident said. The nearest petrol pump in Phuentsholing is located just a few metres ahead of the gate, that is, the entry point to the neighbouring country. "Everyday, I sell around 100 to 150 litres of diesel and around 25 litres of petrol. We have our sources to get the fuel from Bhutan. By selling 1 litre of fuel, I earn a margin of Rs 7-Rs 10," Swarna Biswakarma, a lady who runs one such shop in Jaigaon, said. The economics, they said, is simple. As we visited Phuentsholing yesterday and checked rates at the nearest pump, it was found a litre of petrol costs Rs 59.09 while the rate of diesel is Rs 53.04. On the other hand, today's rates at the petrol pump in Hasimara were Rs 67.75 for petrol and Rs 56.83 for diesel. "We sell petrol at Rs 70 per litre and diesel at Rs 60 per litre, which means a margin of over Rs 10 a litre of petrol and Rs 7 a litre of diesel. Everyday, I earn over Rs 1,000," Swarna said.